A sour stomach is usually temporary and there are many effective home remedies that can help quickly alleviate the discomfort it causes. For example, baking soda helps to relieve an upset stomach by neutralizing stomach acid that causes indigestion or reflux. Or you could try ginger, aloe vera juice, or potato juice to help reduce inflammation caused by an ulcer or a stomach infection. If your symptoms persist and natural methods to relieve stomach discomfort aren’t effective, you may have a chronic digestive condition like irritable bowel syndrome, inflammatory bowel disease, or gastroesophageal reflux (GERD) disease. These digestive issues are more complex to treat and it is best to speak to a doctor. What can you do to get rid of a sour stomach and get your digestive system to function properly again? Read on to find out some of the best home remedies for an upset stomach. First of all, let’s look in more depth at the causes for experiencing a sour stomach and what its symptoms are. A sour stomach typically causes 3 main types of upset in the upper digestive system. You may experience these symptoms all at the same time or you may just have one or two. Nausea. Nausea is one of the most common symptoms of an upset sour stomach. The feeling of queasiness that usually precedes vomiting can be caused by many problems in the gastrointestinal tract as well as other underlying medical conditions. Nausea may not always result in vomiting, but the unpleasant feeling of a queasy stomach can last a long time. Regurgitation. Regurgitation happens when the muscles at the end of your esophageal tract don’t stop stomach contents coming back up. You may find that undigested food and stomach acid comes up as far as your throat and mouth. As the term “sour stomach” would indicate, this gives you a bitter or “sour” taste in your mouth. Stomach bloating. Stomach bloating occurs when gas in the upper gut builds up and gives you a feeling of hard stomach or being full, even though you may not have eaten very much. Excessive bloating can also make your tummy look larger and be one of the reasons for abdominal pain. Stomach bloating can also cause you to pass a lot of gas and have “sour” belches. Acid reflux (heartburn) can cause all of the symptoms associated with a sour stomach. Acid reflux happens when bitter stomach acid escapes back up the esophagus and causes burning and discomfort in your stomach and the middle of your abdomen. You may also feel like you have a throat tickle as the stomach bile irritates the delicate lining at the back of your mouth. Peptic ulcers can also cause a persistent sour stomach because the ulcer irritates and upsets the stomach lining. Most stomach ulcers are caused by the helicobacter pylori bacteria infecting the stomach’s inner layer. Gastritis is a general term for inflammation of the stomach lining. Gastritis can be caused by a number of factors like inflammation due to the H. pylori bacteria that causes ulcers and excess stomach acid (hyperchlorhydria). Other causes include regularly using pain-relief medication and over-consumption of alcohol. Gastritis can cause a temporary sour stomach with a sensation of bloating, gassiness, nausea, and painful indigestion in your upper abdomen. However, if left untreated, gastritis can become a chronic health condition which will give you a recurrent upset stomach. Gastritis is also one of the causes of greasy stools. Gastroenteritis is sometimes referred to as stomach flu and is caused by infection of your intestinal system. Gastroenteritis can give you an extremely upset stomach with strong feelings of nausea, vomiting, diarrhea, and abdominal pain. 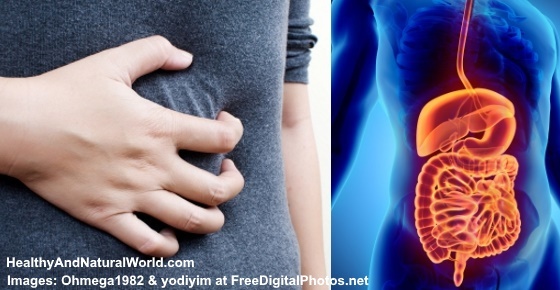 Indigestion (dyspepsia) is a digestive condition that can cause pain and discomfort in your upper abdomen. Indigestion can also make you feel nauseous, have a feeling of being full even if you haven’t eaten much (bloating), and general discomfort in your upper digestive tract. Here are some of the best home remedies to cure a sour stomach. These will help you to get quick relief from the discomfort, queasiness, bloating, and pain that an upset tummy causes. Use baking soda as a natural treatment to quickly soothe an upset stomach and get rid of a sour stomach. Baking soda calms the stomach because it neutralizes stomach acid that causes heartburn and indigestion. If you often experience acid reflux after eating, drinking baking soda water can help to prevent a burning feeling in your digestive tract. Put 1/4 – 1/2 tsp. baking soda in a glass of water and drink after meals to destroy excess stomach acid and treat a sour stomach. Drink one glass after each meal for up to 2 weeks until your sour stomach symptoms improve. If you still have indigestion after 2 weeks, Dr. Derrer recommends that you see your doctor for a checkup. Ginger can effectively alleviate the symptoms of a sour stomach like gas, bloating, and nausea. Ginger contains medicinal compounds called gingerols and that help to reduce inflammation and irritation in the stomach. One of the easiest ways to use ginger to naturally soothe a sour stomach is to make ginger tea. Grate or cut 1-2 inches of fresh ginger root. Put in a cup and pour in boiling water. Cover the cup to stop the anti-inflammatory compounds from escaping via steam and let it infuse for 10 minutes. Drink a cup of ginger tea about 20 minutes before each meal to help calm an upset stomach. Chamomile tea is another natural home remedy for relief from regurgitation, nausea, and bloating that a sour stomach causes. The healing properties of chamomile help to calm irritation in the stomach and reduce inflammation. To get rid of a sour stomach quickly and effectively, put one teaspoon of dried chamomile in a cup of boiling water. Cover the cup and let the herb infuse for 10 minutes. Drink the herbal home remedy 3 times a day to get natural relief from the symptoms of a sour stomach. Chamomile is just one of 10 amazing herbal teas for keeping your digestive system healthy. Others are lemon balm tea, burdock root tea, and dandelion herbal tea. If you have a sour stomach, use aloe vera juice as a natural home treatment to help soothe your gastrointestinal tract and get rid of sour stomach symptoms. After your meal, drink 1/4 cup of aloe vera juice to prevent the symptoms of an upset stomach and soothe digestive disorders. This will help to reduce the acid-causing reflux and put an end to your sour stomach. A word of warning about aloe vera juice: aloe vera is a natural laxative and drinking too much could cause diarrhea or loose stools. Potatoes are full of goodness and juice from potatoes is great for treating various intestinal disorders, including sour stomach. You can naturally treat a sour stomach by consuming apple cider vinegar (ACV) to quickly get relief from gas, bloating, and excessive belching. Apple cider vinegar contains healthy enzymes which are beneficial for improving digestive health and the acidic properties of ACV help to kill off harmful bacteria that can cause stomach upset. Drink apple cider vinegar diluted with water to prevent too much acid forming in your stomach after eating a meal. Mix 1 tbsp. in a glass of warm water and drink before each meal to prevent a sour stomach. You should notice that you have less gas, bloating, and have fewer belches after eating. Activated charcoal has many uses and it absorbs toxins that cause gastrointestinal upset and stomach pains, thus helping to relieve sour stomach symptoms. When these toxins are removed from the digestive tract, it should give relief from symptoms like gas, bloating, and nausea. Take one 500mg activated charcoal capsule with a large glass of water an hour before a meal. After your meal, drink another large glass of water. This will help treat the symptoms of a sour stomach and help improve your digestive health. If you suffer from digestive upset, eating food from the bland diet can help your gastrointestinal system to recover and reduce queasiness, bloating, excessive gas, and other symptoms of sour stomach. The principle behind the bland diet is to eat foods that don’t strain your digestive system. This means avoiding fatty, greasy, and even raw fruits and vegetables until your stomach has got back to proper health. Please read my article on the ultimate guide to bland diet foods to find out how this diet can help prevent heartburn and excessive stomach acid. You will also learn how the bland diet can benefit you if you are recovering from a peptic ulcer, food poisoning, gastroenteritis, or gastritis. If you are prone to a sour stomach or suffer from persistent upper abdominal upset, there are many ways to lower the risk of a sour stomach by following some simple dietary changes. Be careful of dairy foods because they can cause stomach upset in some people who are lactose intolerant. Eat smaller portions of food frequently throughout the day. Avoid eating large, heavy meals. Wait for at least 2 hours after eating before lying down or going to bed. Enjoy a walk or some other light physical activity to help boost your digestive system and avoid the discomfort of a sour stomach. Mayo Clinic. Indigestion: Symptoms and causes. Int J Prev Med. 2013 Apr; 4(Suppl 1): S36–S42. J Trad Chin Med. 2015 Dec; 36(6): 632-636. J Med Pl Stud. 2013; 1(1): 16-25.